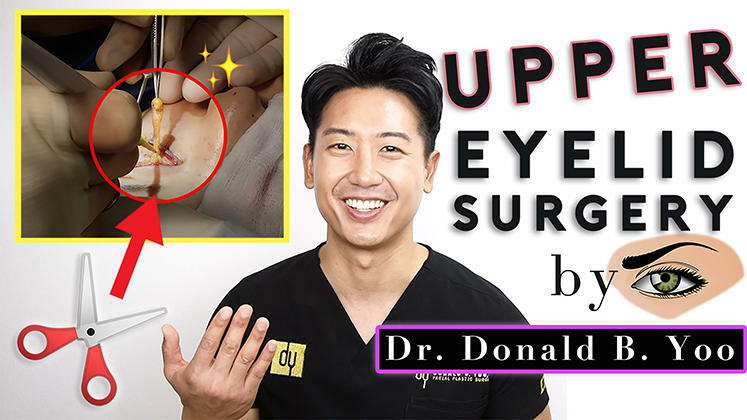 Upper Eyelid Blepharoplasty - Beverly Hills Facial Plastic Surgery - Donald B. Yoo M.D. Eliminate that tired, aged look and rejuvenate your eyes. Blepharoplasty, sometimes called “eyelid lift”, is the surgical procedure performed to improve and enhance the appearance of the upper and lower eyelids. Excess and unwanted skin and fat above the upper and lower eyelids is one of the most common concerns of patients desiring cosmetic surgery of the eyelids. Blepharoplasty surgery helps restore a more attractive and youthful appearance. 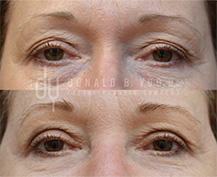 In upper eyelid blepharoplasty, a fine incision is made in the pre-existing crease above each eye. A crescent of excess skin is then removed, as well as all fat (puffiness) that is present. The incisions are then closed with fine stitches, which are removed in one week. In the lower lids, the incision is completely hidden on the inside of the lid. 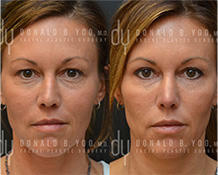 The fat under the eyes is accessed through this incision and mobilized. It is then repositioned to fill the tear troughs (to prevent a hollow look). In some instances, when there is excess skin that needs to be removed, a skin pinch is performed with an incision placed under the lashes so as to avoid a conspicuous scar. As with the upper lids, fine stitches are used to close the incision. The typical post-operative recovery period (the time necessary for bruising and swelling to resolve) after cosmetic eyelid surgery is 10-14 days. It is important to avoid strenuous activity for the first week after surgery. Antibiotic eye drops are prescribed for several days after surgery, and patients cannot wear contact lenses for approximately two weeks after surgery, as the eyelids may be stiff and sore. Makeup can be worn after 10-14 days, and the resultant fine scars, which follow the natural contour of the eyelid, tend to fade in about two to three months. Excess, baggy eyelid skin that in severe cases may interfere with vision (may be covered by insurance). Bags and/or dark shadows under the eyes, frequently caused by excess skin or fat in the lower eyelid which interferes with the patients sight. 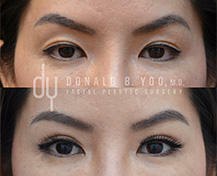 Asian “double eyelid” surgery and creation of an eyelid crease. Incisions are made where the natural crease exists in the upper lid and inside the lower lid. Excess fat and/or skin are removed or repositioned and, if needed, the muscles are tightened. The procedure normally takes only one to two hours for upper and lower eyelids. To minimize swelling after eye lid surgery, the head needs to be elevated for several days following surgery. Following surgery, discomfort is minimal and easily controlled by oral medication. Swelling and bruising subside over 1-2 weeks. Sutures are removed in seven days. A fresher, more rested appearance. A more attractive lid contour.